What is the difference between a BACnet router and a BACnet gateway? A router is used to connect BACnet to BACnet while a gateway is used to connect BACnet to something else. The most common use for a BACnet router is to connect BACnet IP to BACnet MS/TP. Not only are the networks physically different in terms of wiring, but the networks use different encapsulation of the data. The data itself is made up of the same string of bytes on the network, but the network packet containing the data bytes has a different structure. BACnet devices have the ability to discover other devices by broadcasting a Who-Is to the network, and waiting for I-Am replies. When the router receives the Who-Is on one network, it forwards that message to the other network. When the I-Am replies come back, the router forwards them to the originating network. If the router is a learning router, it also remembers what networks are where. There can be multiple routers connecting multiple networks, and each router needs to know how to find each network number. Every BACnet request or response includes a header with routing information. For devices communicating with another device on the same local network, this header will not contain any forwarding information. But for devices communicating with another network, this header will include information that lets the routers guide the message to its final destination. Do I need a gateway instead? The answer is “yes” if you need to connect BACnet to some other protocol. For example, interfacing a Modbus device to a BACnet network is one of the most common applications for a Modbus to BACnet gateway. 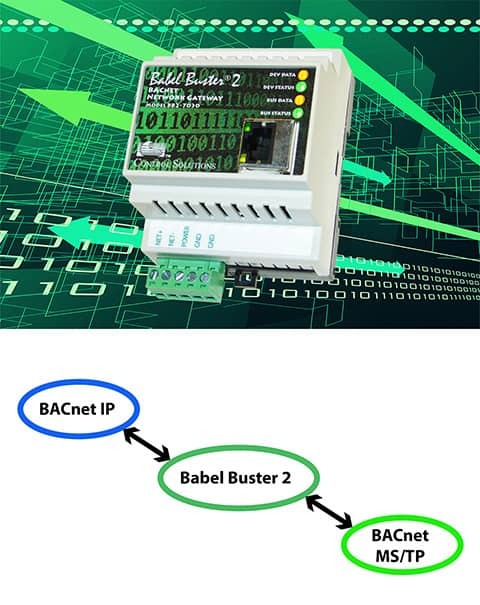 Control Solutions’ Babel Buster gateway family includes support for connecting Modbus RTU, Modbus TCP, SNMP, and LonWorks to either BACnet IP or BACnet MS/TP. Babel Buster®... The BACnet Gateway Brand Everybody Remembers.